When I started shopping for my engagement ring, I quickly realized that I was torn between two considerations: 1 Style of my ring 2. Size of my diamond My fiance and I set a certain budget: no more than $1,000 for the diamond and no more than $2,000 for the ring (setting), and set out on a quest to find the perfect setting and the perfect diamond that would together become my dream engagement ring. After searching in different large and small jewelry stores in Boston and throughout Israel when we were there on vacation, I found just what I was looking for! I also learned a few things along the way, that may be helpful to you as you shop for your own engagement ring. The wife of the jeweler/store manager of a shop where I ended up getting my ring from, told me that based on over 20 years in the jewelry industry, she has developed a rule to swear by when you buy an engagement ring: You should pick the ring for the diamond. This means that you first pick the diamond that you love and then find a ring that accentuates the stone’s natural beauty. As I went on my search, I kept thinking back to this rule, and I realized that I disagreed with it. 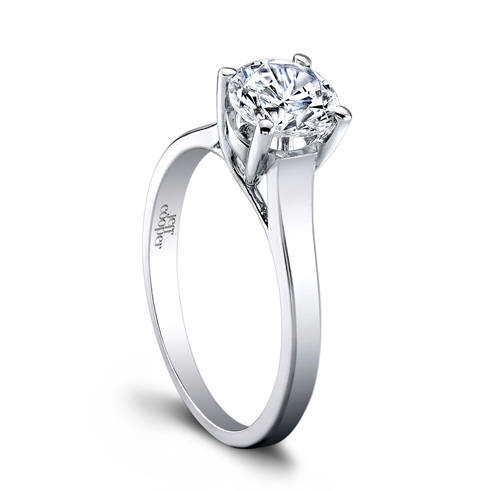 Instead, I focused my energy on finding the perfect ring prior to the diamond. The reason is simple: this rule only holds true if you have a budget to spend on an expensive diamond that would be at least 1.5-2CT. When you have a big diamond, then it does not really matter what ring you have, because the diamond will hold its own. 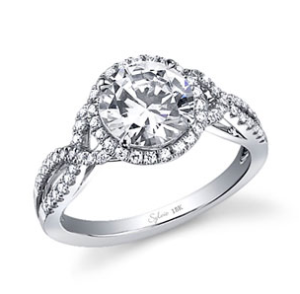 However, when your budget only allows you to get a stone that is under 1K, getting the right ring can make a huge difference in the overall look. Use our Diamond Price Calculator to estimate the cost of your stone. Whether you can afford to only get a small diamond or a large one, having a fancy ring setting can make it look even bigger! I have tried on a few dozen engagement rings all for a diamond size between 0.4-0.75CT., and I discovered that settings which had small diamonds around the crown, as well as on the sides of the ring made the diamond look visually bigger. Some rings have way too many diamonds in them: I found the ones that have really tiny diamonds that almost look like diamond dust, actually look kind of cheap, while the ones that had a few bigger stones all around looked really beautiful and original. If you are trying to stay within a certain budget, that is on the low-end, I find that you end up getting a better stone if you agree to compromise on size and spend your dollars on CUT and CLARITY of a diamond, as these are the two factors that make the most difference visually. I have looked at some diamonds that were around 1 CT, but were only Good Cut vs. Excellent Cut and had an H or K color vs an E or F, and when put inside the ring looked much duller and less attractive than smaller diamonds that had a near white color and an Excellent Cut. I discovered that a diamond with an excellent cut, will actually look visually the same size as a larger diamond (about 20% larger) that was poorly cut. So I actually ended up paying close to $912 (including tax) for a 0.49CT with an F color, I1 clarity (with a small inclusion off on the very edge of the stone and not visible to the eye), an Excellent Cut, and its a real beauty! While it may be that you walk into a jewelry store and find both the perfect ring and the perfect diamond there, it is worth it to shop around for both in different places. You do not really get a discount for buying both the ring and the diamond in one place, so you can actually make the best deals when you buy them separately. 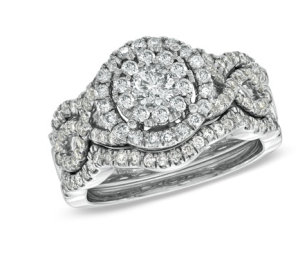 I found that smaller, privately owned jewelry stores pay more attention to your needs and offer a larger selection of high quality rings and stones. On the other hand, large chain stores or discount stores, carry large selections that really suffer in quality of diamonds and craftsmanship of rings, and tend to be way overpriced. If you are looking for a truly original ring, than it is absolutely worth it to pay more and go to a small artisan jewelry store, where the jeweler hand-makes all the rings himself. While I found that all jewellery stores I went to told me that if I bring them a picture they will replicate the design, looking at the rings in many of these stores, there was a clear difference in the level of craftsmanship. The jeweler, Michael Shneyder of EuroDesign Jewelry, that I ended up getting my ring from, makes each piece as if it were a work of fine art, and goes out of his way to recreate your vision. He suggested small details to enhance the design that I wanted, which I have not seen in any other store, which made me feel great that my ring will be really special. This article contains great information. I believe that our customer need a lot of this information before shopping for a ring. I especially loved the part about “Size is not King”. People are always looking for a large carat diamond and then also want it to be clear and brilliant with a certain budget. It is hard to get both unless you have a very large budget in mind. Cut and clarity are very important and will make that diamond stand out no matter what size it is and gets you the best bang for your buck. Keep sharing.